Something I’d seen on TV as a child haunted my memory for years. It involved a perky teenage girl beginning her service as a hospital volunteer. In her starched candy-striper uniform, she was the picture of efficiency. During her first day on the job, however, she made a terrible mistake. An old woman patient begged the girl for a glass of water, and the girl gave it to her. She didn’t know that the woman was on her way into surgery and barred from drinking food and water. The old woman’s doctor became furious with the girl because her mistake could have cost the old woman her life. Many years later, I saw this show again. My husband, who watched with me, had never seen it before but had heard my description. Well, the show wasn’t quite the way I remembered it. The old woman’s begging and the doctor’s reaction weren’t nearly as dramatic on film as they were in my memory. My husband still teases me about this incident when I share other childhood memories. In my defense, CBS showed Family Affair in daytime reruns from September 1970 to January 1973, so I was no more than four when I watched Cissy Davis’ stint as a candy striper. But that scene and others made a vivid—if inaccurate—impression on my young mind, and gave Family Affair a special place in my heart. Too young for the show’s 1966-1971 primetime run, I discovered it in those daytime reruns. After that, it pretty much disappeared until TV Land aired it in the 1990s. Revisiting the show then was like encountering an old friend. I enjoyed it so much that in the late ‘90s and early aughts I ran a comprehensive Family Affair web site. Since that site is lost in the mists of time and the wreckage of Geocities, I am declaring Fridays Family Affair days on Embarrassing Treasures. Starting next week, I’ll take a fresh look at one episode each week and share images from my large collection of Family Affair memorabilia. Why do I like Family Affair so much? 1. A strange poignancy permeates the show and makes it stand out from similar shows. Unlike every other classic TV sitcom whose premise involved dead parents (My Three Sons, The Brady Bunch, The Partridge Family, and many more), Family Affair showed kids who remembered and missed their parents occasionally—not just in the first episode or even the first season. 2. Brian Keith is my favorite on-screen father figure ever. Whenever his paternal love radiates through his ruggedly masculine persona, I melt. This happens often in Family Affair, but my favorite Brian Keith dad moment comes in Disney’s 1961 The Parent Trap. Check out the scene that begins at 4:00, when he realizes he’s seeing his daughter Sharon for the first time since she was a baby. When Keith died in 1997, Entertainment Weekly called him an underrated actor—I wholeheartedly agree. 3. Mrs. Beasley! What sitcom ever had a product tie-in like this one? Her old-lady look is unique in the world of dolls and straddles the line between cute and creepy. Episodes where Mrs. Beasley gets lost are always great. 4. The setting is exotic. Sure, it’s just New York City. But to small-town kids like me, a city childhood did seem exotic. Buffy and Jody lived in a high-rise apartment building and had a terrace. They played in Central Park. A British butler was their babysitter. 5. Mr. French! 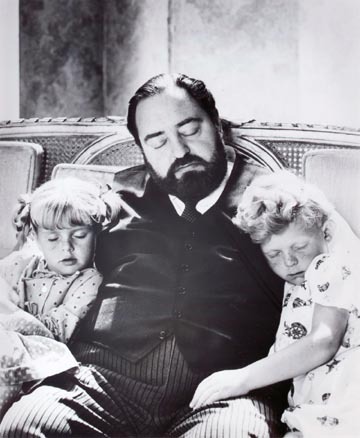 Sebastian Cabot’s chagrined portrayal of Mr. French, forced to take on a nanny role he never sought, cuts the show’s saccharine level and provides some genuine humor. 6. Buffy and Jody. The names alone are fun to say. (As a young child, I thought “Buffy and Jody” was the show’s title.) Anissa Jones and Johnnie Whitaker are genuinely adorable in the early seasons, although they later faced the curse common to sitcom kids—a mandate to continue being little and adorable long after it was possible or desirable. 7. That jaunty Frank De Vol theme song and the kaleidoscopic opening effect that mesmerized me as a child (and reminded me of my grandma’s bingo markers). My memory never failed me where that was concerned. This entry was posted in Family Affair, Television and tagged 1960s, 1970s, Anissa Jones, Brian Keith, Family Affair, Johnny Whitaker, Kathy Garver, Nostalgia, Parent Trap, Sebastian Cabot, Television. Thanks for your thoughtful comment. My experience learning about Anissa Jones’ death was similar to yours. I was too young to watch the show when it originally aired, so I first encountered it during the CBS reruns. I was also young enough that I didn’t hear about her death on the news when it happened, but about three years later a fourth-grade classmate blurted out an insensitive comment about it. I remember asking my mother after school if it was true and feeling very shocked and disturbed. In this blog, I try to focus on the show and its characters instead of the actors’ lives because the real-life story is just too sad.